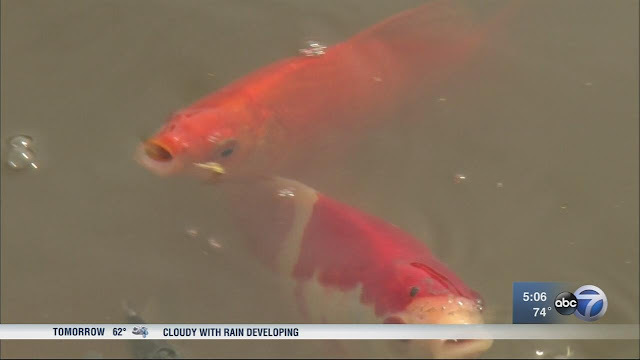 Thousands of dead fish are washing up on the shores of the McKinley Park Lagoon. In the spring, the city fills the lagoon with fish for recreational fishers during the spring and summer, and what's happening may not be pretty but it is natural. The brutal ways of nature play out on the surface of the man made lagoon. "We noticed yesterday that a lot of fish were dead, they were floating up at the top, and the ones that were still alive were up at the top, at the surface trying to breathe," said Samantha Hertel, vice president of the McKinley Park Advisory Council. Thousands, of gold fish, blue gills and typically bottom-dwelling catfish began floating and struggling for the surface yesterday afternoon. "The large die off of fish we saw is likely because of low oxygen levels in the lagoon," said John Belcik, student in population genetics at the University of Illinois - Chicago. In the fall the city drained the lagoon after human remains, including a severed skull, turned up in the water as part of a homicide investigation. "The drainage left the fish where they are but it really pumped out a lot of these phytoplankton, the algae that produce oxygen," Hertel explained. It didn't matter so much in winter, but now with warmer weather and the summer fishing season upon us that lack is easily seen. "The algae population really hasn't had a chance to grow and get back up to right size to produce levels of oxygen needed for these fish," Hertel said. Park Service employees are now scrambling to clean up the carnage in order to keep seagulls and raccoons from feeding on them while they restore oxygen to sustainable levels. Park Advisory embers said the situation has vastly improved since Monday. The city has turned on the aerators in the lagoon to add oxygen to the water, but full restoration of oxygen levels could take up to a week. The Chicago Park District released a statement about the dead fish, saying: In response to the hundreds of dead fish in the McKinley lagoon, a fish kill over winter is normal, as the lagoon freeze a percentage of the fish die, a normal event every spring. The issue is exacerbated at McKinley because of the low oxygen level in the water. The warm spring has made the fish more active than they would normally be at this time of the year, causing an increased demand on the oxygen in the water. The low level of oxygen is due to a low water level as a result of draining the lagoon in the late fall to assist the Chicago Police Department. The Chicago Park District issued further water testing to confirm that there aren't any chemical issues in the water and will continue to monitor the water closely through the spring season. In the short term we are turning the water on overnight to increase the water level, this will also help increase the oxygen level in the water. Once the issue is resolved the lagoon will be stocked for fish.